Wow. This has been a week (or two). The Supreme Court ruled on gay marriage and the validity of the Affordable Care Act. Violence erupted in a church in Charleston, South Carolina, causing some unpredictable responses – forgiveness, love and a move to place the confederate flag only in museums. The human condition is interesting isn’t it? We are flawed. We all know that. But, when it comes to these issues we tend to believe that the other person is flawed and we are not. Why is that? Humans are in need of some anchors – beliefs that tether them to something that doesn’t move or shift. We look for these anchors in all aspects of life. We adopt a professional or college sports team and pay homage to it, sometimes anchoring ourselves to it as it sinks, hoping that it will resurface. Our beliefs are shaped by our family of origin and the culture in which we live. Since we have an emotional attachment to both, we connect strongly with those widely held beliefs. After all, if we begin to deconstruct these beliefs we are in danger of alienating ourselves from our family or the people in our culture who invested time in our development. As our life experiences give us different inputs we begin to internally question these beliefs, rarely turning from them, especially if they don’t fit the beliefs we have spent the majority of our life forming. This causes internal conflict that only surfaces in anger, frustration and defensiveness. Why can we not rely on these anchors? An anchor is locked into a land mass which shifts ever so slightly upon tectonic plates. These plates exist on an earth which is constantly rotating and orbiting around the sun. Evidently our solar system and galaxy are in constant motion also. Therefore, the anchor is an illusion in a universe of constant change. I am about ready to poke at a raw nerve for some. So, stop reading if you aren’t ready. Take marriage for example. Many talk about God ordained marriage between a man and a wife. I am married. I believe God was involved in our meeting and our union. Some people cite the Bible as ordaining the institution of marriage. Here is where it gets sticky. Who in the Bible do we look to for the Godly example of marriage as we view it in today’s modern culture? There is certainly a long list of Godly men who had many wives and concubines. See Abraham, David and Solomon to name a few. Fast forward to the New Testament. Our most revered Biblical characters weren’t even married. See Jesus and Paul. Do we simply select the individuals in the Bible who we feel practiced in the manner we wish to practice today? Isn’t this choosing scripture to suit our needs instead of allowing scripture to inform us as to what we need? If I didn’t hit a nerve and send your blood to a boiling level, you are probably with me on this point. Marriage, and the behavior within a marriage, has been an ever changing social construct. To be fair, it is a decent place to anchor if one realizes that it changes too, even slightly. Most of our anchors are like this unfortunately. We desperately want to believe in things that are solid, people and ideas that don’t move. It gives us security and allows us to build other systems of beliefs and practices. So, we drop our anchor into these things and then feel betrayed as the opinion of others causes waves to crash over the bough of our beliefs. What if we chose only one anchor? The writer of Hebrews (in chapter six) says the nature of God’s purpose is unchanging. “We have this hope as an anchor for the soul, firm and secure.” (verse 19) The waves of change may rock us back and forth, sometimes unsettling us or upsetting us. But, this anchor in God’s nature is the one that never shifts. There will be other weeks like the last few. Many others. Where will you sink your anchor? Steve Schneeberger is the Executive Director of the Youth Ministry Institute. Beginning in 1985, Steve began a vocation as a youth minister serving churches in Kansas and Florida. 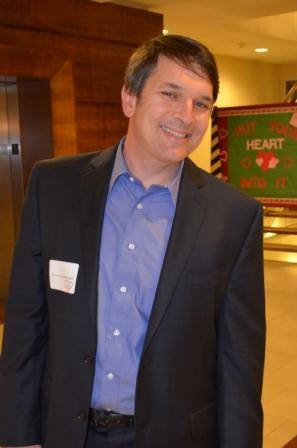 He is a 1981 graduate of Shawnee Mission West High School in Overland Park, Kansas, has a business degree from Baker University (1985) and a law degree from the University of Kansas (1988). He is married to Carol, an elementary school teacher and former counselor. They have three children. They have lived in Orlando, Florida, since 1994. Steve consults, coaches and teaches Visioning, Organizing and Planning for Success, Budgeting, Helping Youth Over Developmental Hurdles, Beginning Leadership – Mastering the Core Competencies, Conflict Resolution and Expecting Great Behavior for the Youth Ministry Institute.